KABUL, Afghanistan (CNN) -- A Taliban suicide bomb squad disguised as regular Afghan army troops stormed a strategic city close to the border with Pakistan Tuesday, prompting a fierce six-hour battle with U.S. troops, local officials and the U.S. military said. A U.S. soldier on patrol in Khost province in February 2009. 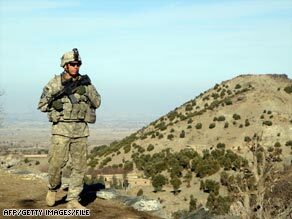 The insurgents attacked a municipal building in the center of the city of Khost, a U.S. military spokesman said. At least 10 suicide bombers were killed in the attacks, which also left five troops and four civilians dead, Afghan police said. Local police chief Abdul Qayum Baqee Zoi told CNN the attacks, which ended at 4:30 p.m. involved 10 Taliban suicide bombers in Afghan National Army uniforms and explosive vests. Seven detonated and three were shot dead. A U.S. military spokesman said the city -- a hotbed of Taliban activity --remained volatile as reports of running battles, kidnappings and fatalities surfaced. The developments came shortly after the United States announced it was changing its military leadership in Afghanistan, replacing Gen. David McKiernan with Lt. Gen. Stanley McChrystal, a former special operations chief. Tuesday's fighting began when U.S. forces responded to a suicide bomber at a government compound in the city and came under heavy attack, the U.S. military spokesman said. Officials in Khost told CNN that insurgents attacked the municipal building, and the police chief there said attackers killed two police officers, two security guards and two civilians in that incident. A Taliban spokesman in Afghanistan earlier told CNN 30 Taliban fighters were involved in the attack, and confirmed they were suicide bombers wearing explosive vests. The U.S. military spokesman said U.S. troops killed several militants but had to fall back. A U.S. quick reaction force from a nearby base was called in, entering the city with U.S. ground forces, he said. The spokesman said additional Taliban suicide bombers then entered government buildings, killing additional Afghans.